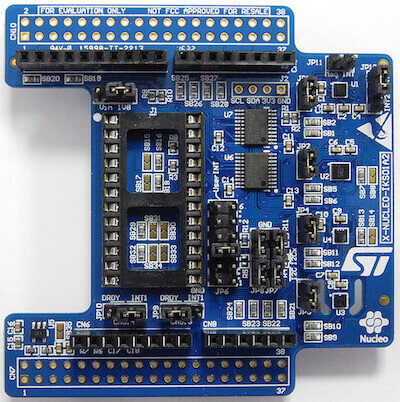 The X-NUCLEO-IKS01A2 is a motion MEMS and environmental sensor expansion board for the STM32 Nucleo. It is equipped with Arduino UNO R3 connector layout, and is designed around the LSM6DSL 3D accelerometer and 3D gyroscope, the LSM303AGR 3D accelerometer and 3D magnetometer, the HTS221 humidity and temperature sensor and the LPS22HB pressure sensor. The X-NUCLEO-IKS01A2 interfaces with the STM32 microcontroller via the I2C pin, and it is possible to change the default I2C port. More information about the board can be found at the X-NUCLEO-IKS01A2 website . Using the x-nucleo-iks01a2 shield is quite similar to use the shield x-nucleo-iks01a1 for which the X-NUCLEO-IKS01A1: MEMS inertial and environmental multi-sensor shield application is provided (see Shields for more details).